Good thing I ordered 5 bottles of Nikka 12 this trip. I am planning on ordering more. I really like this blend. It's way better than Hibiki Harmony and an only age statement bottle that wouldn't break your bank! I saw Hakushu NAS mini in FamilyMart in January this year. 5 bottles at the same time. It is in Kobe. Go figure. I actually think Hibiki Harmony is better. Depends on your personal taste. Where are some places we can get the mini bottles of Hibiki in Osaka/Kyoto area? Do they sell the mini bottles in NRT airport? rustykettel and 7473chad like this. Very nice! Did you buy them all!? Good to see they are still selling them at the retail prices! I've seen The Nikka 12 sold in a new, slimmer box, in some stores. I still like the bigger box for gifts. Thanks for the heads up. Got 5 of the last seven Yamazaki minis, while the guy in back picked up the remaining two. No minis sold at Japan airports. Finding any Hibiki 17s in the wild is random and rare. That's for sure - there is an article on Forbes which explains why the mini was priced cheaper than equivalent of 1/14th (50ml/700ml) - it was to encourage tasters. Takashimaya told me today they had the stock from two years ago, and finally decided to release it. Japanese department stores can only sell at retail, and cannot limit orders - so it was a bonanza at the weekend. 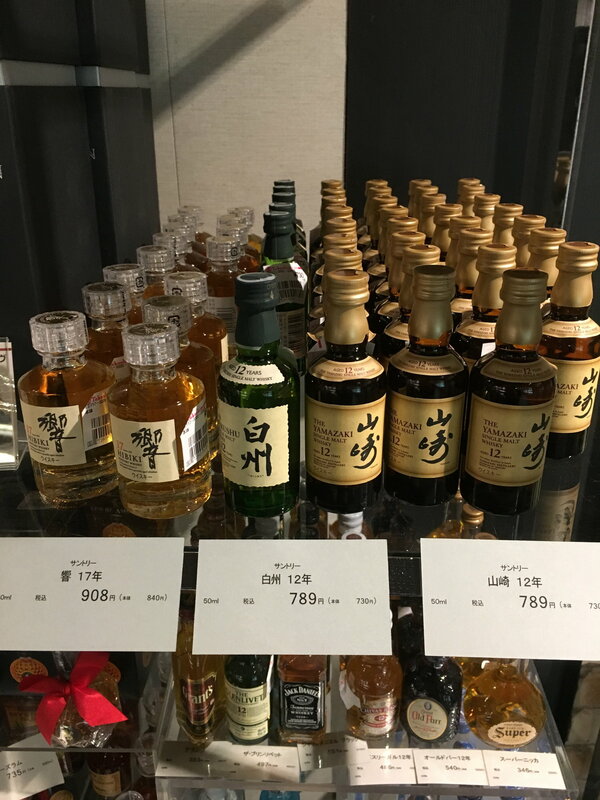 BTW, BIG is now out of Hibiki, and a walk through Ginza has the Hibiki Blenders Choice from 14,800 (Mountain) to 24,000 (forget, but think it was Sokuhai) - compared to the retail of 10,000 as seen at Hasegawa once in December and January. Hasegawa is now forcing customers to buy Miyagikyo NAS if they wish to purchase a NFTB (which is already a little overprixced) A shame they've resorted to sleezy tactics to move unwanted bottles. They also bumped the price of Nikka 12. The owner told my buddy they won't be getting any more Blenders Choice, hopefully he's mistaken , not holding my breath.